Now that the Chef client 13 is available, I decided to upgrade my ARM build to the latest release. ARM is still not officially supported, but building was fairly straightforward. I had Chef 12.17.1 on the box already, but I needed to upgrade the build tooling first. Now I could finally get to installing Chef 13.1.12. About 2 hours later I had my ARM Chef client .deb built. As the root user I installed it and ran it. And approximately 2.5 hours later I had a new chef_12.17.1%2B20161110041345-1_armhf.deb which worked great once installed. I’ve finally had practical reason to get the BeagleBone Black out of the drawer and start using it as an home server (more later). It’s a nice, quiet little machine with 512 megs of RAM and a 1ghz ARM CPU. I followed the instructions from https://beagleboard.org/getting-started to connect to it via the serial port over USB, which allowed me to connect to the web server on the included OS. Turns out I didn’t really need to do this, all I needed to do was flash my microSD card and install Debian on it. I downloaded the latest Debian stable “Jessie” build for ARMHF from here. That image turned out to be a bit bloated with X and desktop tools, so I switched to the “IOT” image. I flashed the image onto a 32 gig microSD card with Etcher for OSX, which was quite painless. I changed the debian user password away from the default and plugged in a network cable. Once it was on the network I could SSH to it, I probably didn’t need to use the serial console at all if I’d just looked for the IP address off the router. I copied over my SSH key so I wouldn’t need to use my password when logging in. Next I did an apt-get update; apt-get upgrade to get the latest bits and then shut it down. I plugged directly into the router and powered via the USB port, since it’s meant to be an externally-accessible bastion box. I checked the list of timezones and set mine to Sydney. Now it was ready to use. 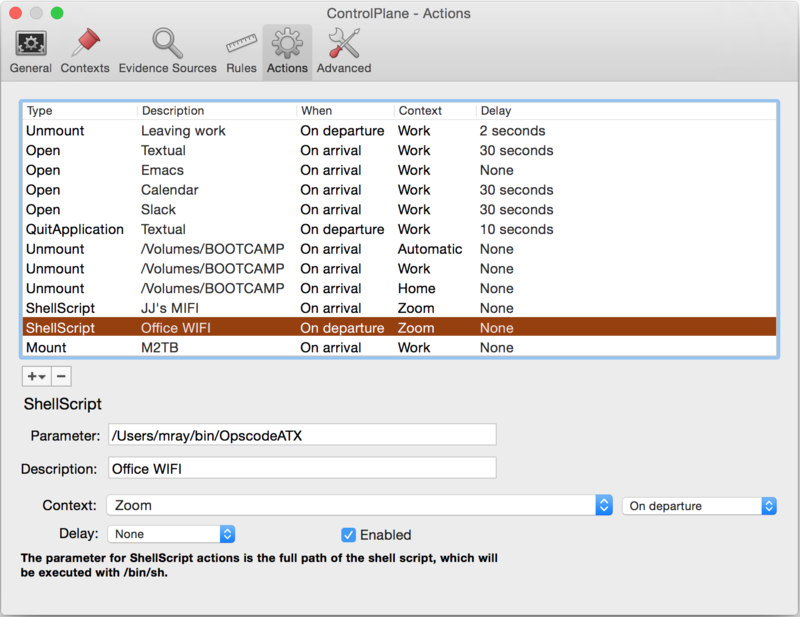 I’ve been a longterm user and big fan of the program ControlPlane, which uses information from the environment around you (attached devices, location, networks, etc.) to change configurations in response. In my own usage, I change Time Machine backup drives based on which networks I’m on and use it to automatically start a handful of applications when I get to work (Emacs, Slack, etc.). At my current office I have a pretty poor Internet setup because we’re subleasing and don’t have a permanent connection. I’m using a Clear Wireless modem that gets about 10/1Mb/s down/up which is usually fine except for the fact that I’m now sharing the bandwidth with coworkers and Sprint is actively taking down the WIMAX network as they phase out this service. Luckily one of my coworkers has a MIFI puck that does a speedy 20/4Mb/s, but it’s not an unlimited data plan like the Clear modem. I do a lot of video conferencing and our current tool of choice is Zoom. Compared to the other tools we’ve used over the years, it’s really great but with the strain on our network I’ve been having a lot of pauses and stutters on the slower network. With that bit of knowledge I created a pair of shell scripts to switch between the two Wi-Fi options. In the ControlPlane Preferences I added a new “Zoom” choice under Contexts. Next I added “Running Application” as an Evidence Source. 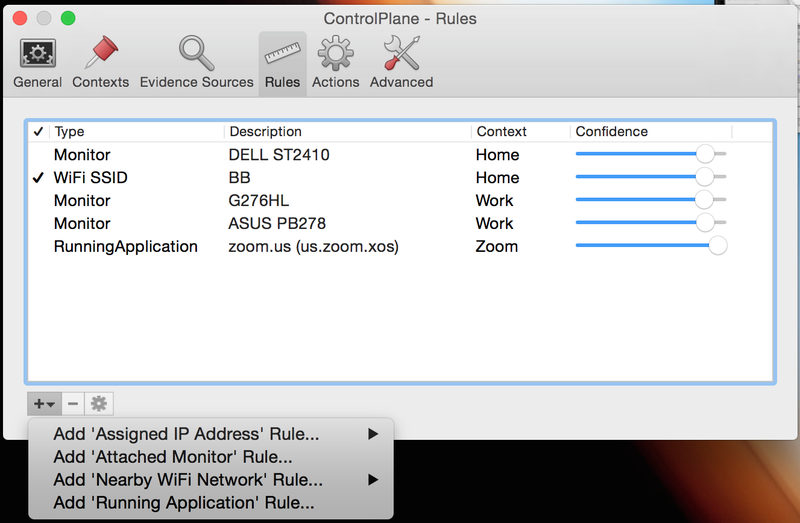 Next I started up Zoom and under Rules selected “Add ‘Running Application Rule'” and choose “zoom.us (us.zoom.xos)” with the Context of “Zoom”. Finally under Actions I added a pair of ShellScripts to be executed immediately when entering the “Office” and “Zoom” contexts when triggered. The Internet is still pretty poor in my office, but now when I start up Zoom there’s a brief hiccup as the Wi-Fi switches over to the faster wireless provider. When I shut down Zoom I automatically switch back to the slower, unlimited bandwidth Clear network. Hopefully we’ll be getting a new office soon with a dedicated Internet connection with a lot more bandwidth, but this is a decent work-around in the meantime. Build your own Wikileaks mirror using Chef. From InfoChimps: ClusterChef will help you create a scalable, efficient compute cluster in the cloud. RVM: manages multiple installed versions of Ruby. My PS1 is automatically configured now to show the output of rvm-prompt with the use of a after-use hook. Git-Up: automatically fast-forwards a git rebase. gem-open: opens up the Gem’s source in your $EDITOR (which should be emacs). gem-man: opens man pages for Ruby gems. rvm.el: RVM integration for Emacs. I also recently put my .emacs and .bash_profile into my GitHub account, to track changes as I make them. Feel free to send me any other suggestions or pointers, I’m always happy to learn more.